Trails  from wilderness pathways to super highways  connect kin to kin, friend to friend, trader to trader, customer to merchant, warrior to foe, the adventurer to adventure, the tycoon to empire, the refugee to sanctuary, the needy to renewal and hope. As enduring marks across the landscape, trails recall the daring, industry, drama and, often, the folly of the human experience. Through a series of articles, we are retracing some of the renowned trails of the Southwest. Along the way, we’re not only going to follow old routes and visit old landmarks. We’re going to meet a wide cast of characters, including Native American nomads, itinerant traders, warriors and displaced peoples; Spanish conquistadors, friars, colonists, merchants and mystics; and Hispanic and Anglo adventurers, entrepreneurs, soldiers, colonists, heroes, scoundrels, railroad barons and impoverished migrants. We’re going to resurrect stories which unfolded along the trails. We’re going to share in players’ experiences on the trails through their chronicles and diaries. We’re going to revisit scenes memorialized by the travelers’ experiences. We’re going to recall chapters in an epic drama which unfolded across a wild and diverse landscape. From east to west, our stage spans the Llano Estacado, or "staked plain," in the western Texas Panhandle and eastern New Mexico; the Southern Rocky Mountains, in central Colorado and north central New Mexico; the Colorado Plateau, in northern Arizona, southeastern Utah, southwestern Colorado and northwestern New Mexico; and the range and desert basin country, in western Texas, southwestern New Mexico, southern Arizona, Nevada and southeastern California. The Llano Estacado, or Caprock Plateau, a shortgrass plain about 4000 feet above sea level, signals the transition from the eastern grassland prairies to the western desert basin and range country. It extends as level as a placid sea from horizon to horizon, with only occasional playas, or shallow depressions, interrupting the flatness. When Coronado’s expedition crossed the Llano Estacado in 1541, buffalograss  cool green in the spring and summer and warm amber in the fall and winter  carpeted the landscape. An ideal grass for an arid region, it grew about six inches high but put down roots four feet into the soil in its quest for moisture. It served as a verdant backdrop for a springtime explosion of gold, scarlet and blue prairie wildflowers, including daises, Indian blanket, Indian paintbrush, prairie clover and prairie gentian. Taller grasses, like the bluestem, surrounded the playas. Millions of bison, or buffalo  the symbol of the Great Plains  grazed the buffalograss and bluestem and wallowed in waters trapped in the playas after a rain. Comparable numbers of pronghorn antelope browsed the flowering plants. Packs of gray wolves preyed on both the buffalo and the pronghorns. Clouds of migrating waterfowl settled into the playas as temporary quarters in the fall and winter, rising and circling and calling in the sky at dawn before heading to the open plain to feed. The Llano Estacado served as part of the breeding grounds, nursery and range for one of the great wildlife populations of the world. Throughout the Llano Estacado, 15 to 20 inches of rain fall in an average year. The wind blows incessantly, typically from 10 to 15 miles per hour and often at much higher velocities, causing scarce surface water to evaporate more swiftly. Sometimes, violent thunderstorms and tornadoes issue from the skies to strike the land ferociously during the spring and summer. Sullen gray clouds, snow, sleet and icy winds sometimes sweep from the north to turn the plain into a frozen tableau of white during the winter. The eastern side of the Llano Estacado drains into either the Canadian, the Red, the Brazos or Texas’ Colorado river systems. The western side drains into the Pecos River, a tributary to the Rio Grande. In the midst of the Llano Estacado, with a pale blue and cloudless half sphere of sky overhead and an endless carpet of grass below, early explorers felt awestruck and even disoriented by the elemental starkness and simplicity of the Llano Estacado. Pedro de Castaneda, chronicler of Coronado’s expedition, said that a traveler across the Llano Estacado would not see "a hill or a hillock which was three times as high as a man. Several lakes were found at intervals; they were round as plates, a stone’s throw or more across… The country is like a bowl, so that when a man sits down, the horizon surrounds him all around at the distance of a musket shot." The Southern Rocky Mountains, like the Rocky Mountains as a whole, apparently arose as the North American continent slid westward over a subsurface crustal formation  or "plate"  70 to 40 million years ago, beginning at about the time the dinosaurs died out and the mammals ascended. Peaks, divided by mountain valleys, rose to more than 14,000 feet above sea level. Structural deformation, faulting, volcanic activity, erosion and glaciation joined forces to sculpt the stony pinnacles. The Sangre de Cristo range, extending some 100 miles from north to south along the eastern edge of the Southern Rockies, became one of the longest mountain chains on earth. It has 10 peaks over 14,000 feet high and more than 24 peaks over 13,000 feet high. The Sangre de Cristo range served as a spectacular backdrop for the first Spanish settlements in the Southwest. If we descended from the tops of the barren (except for lichens, mosses and herbs) peaks of the higher mountains to an elevation of about 11,000 feet above sea level, we would discover that the advance guard of the forests  bent, gnarled and twisted Englemann spruce, subalpine fir and limber and bristlecone pines  have established a tenuous beachhead. Between approximately 11,000- and 9500-foot, these hardy species grow into full, if relatively small, trees, becoming true forests, with the Englemann spruce and subalpine fir dominating. They are joined by other trees such as the blue spruce and lodgepole pine and by shrubs such as the myrtle blueberry and wolf current. Between 9500 and 8000 feet, around the mountains’ mid-sections, the Douglas fir and aspen trees take center stage, accompanied by shrubs such as raspberry and thimble berry. Between 8000 and 6500 feet, the ponderosa pine and Gambel oak assume command of the forest, reinforced by maples, bearberries and Rocky Mountain juniper. Narrowleaf cottonwoods, thinleaf alder and water birch lay claim to the banks of streams. In the foothills, pinyon pines and juniper  relatively small trees  take over, creating a "pygmy forest." Cottonwoods, walnuts and sycamores now grow along the streams. In the semi-desert brushland, about 4500 feet in elevation, sagebrush, greasewood, rabbitbrush and winterfat often play featured roles in the plant communities. As we descended from the mountain tops, we would find that the plant communities grade one into the other. Their populations vary by mountain neighborhood, responding to differing types of soil, strength of prevailing winds, exposure to sunlight and access to moisture. In the summers, elk, deer, bighorn sheep and Rocky Mountain goats  followed by mountain lions, bobcats and coyotes and other predators  move into the higher elevations to graze and browse. With the coming of fall and winter, the larger animals move down the slopes to escape the snows and frigid winds, while smaller animals such as the marmot, pika, mole and shrew remain at the higher elevations through the bitter season. Some deer, the bears, various predators, rabbits, weasels and porcupines stay at the lower mountain elevations throughout the year. Grouse and rosy finches occupy the higher elevations, and mountain bluebirds, Steller’s jays, ruby crowned kinglets and others give color to the lower elevations. Eagles, hawks and owls patrol the skies throughout the mountains. Furious storms out of the west can strike the higher peaks at any time during the year, but especially in winter, when they can bring snows by the foot, temperatures well below zero degrees Fahrenheit, and winds at hurricane force. (Gavilan, New Mexico, at an elevation of only some 7000 feet, at the southeast end of the Southern Rockies, recorded a temperature of minus 50 degrees Fahrenheit on February 1, 1951.) The weather moderates on the lower slopes. Typically, in the foothills, rain and snow storms account for 10 to 20 inches of precipitation annually in the foothills  less than half that of the higher peaks  and average temperatures (Fahrenheit) range from 50 to 60 degrees to 80 to 90 degrees in the summer and from and from 20 to 30 degrees to 40 to 50 degrees in the winter. The Southern Rockies, especially the Sangre de Cristo mountains, became a refuge for travelers who had just endured the hardships of crossing the Great Plains or the desert basins. When Susan Shelby Magoffin, who traveled down the Santa Fe and Camino Real trails in June of 1846 with her husband, veteran trader Sam Magoffin, first saw the Sangre de Cristo range, she said in her diary, "We are surrounded, in the distance, by picturesque mountains, a relief to the eye when one is accustomed to behold nothing save the wide plain stretched far on all sides meeting the edges of the bright blue sky and appearing more like water than land." When Second Lieutenant George Rutledge Gibson, who traveled north up the Camino Real during the Mexican-American War, in May of 1847, approached the Sangre de Cristo range, he said in his journal that he "came in sight of the Mountains North of Santa Fe, their snowy summits glittering in the sun and presenting a novel sight to men just from the sunny south, the air at the same time being evidently cooler and more bracing." 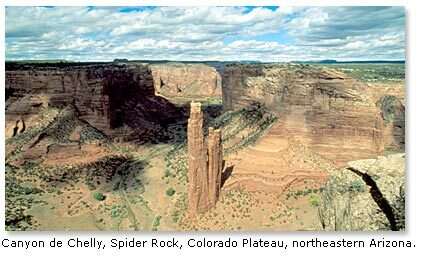 While lands to the east and west rose and fell and collided and tore apart over millions of years in response to the tectonic forces beneath them, the Colorado Plateau kept its basic geologic structure intact, apparently floating much like a raft on a subsurface sea of molten rock. It became not a single plateau, but rather a 130,000-square-mile, one half billion-year-old complex of plateaus, canyons and mountain highlands, an immense fairyland of phantasmagoric geologic formations, and a burial ground of the dinosaurs. With infinite patience and persistence, nature’s practiced sculptors  wind and water  have carved the Colorado Plateau and its layered depositional beds into a labyrinth of mesas, buttes, canyons, arches and abstract stone monuments. They have left us with natural sculpture gardens such as the Bisti Badlands of northwestern New Mexico, the Canyonlands in eastern Utah, Monument Valley in southeastern Utah, Bryce and Zion National Parks in southwestern Utah, Canyon de Chelly in northeastern Arizona and, of course, the incomparable Grand Canyon of northwestern Arizona. In other areas, wind and water have laid bare the remnants of life from times so ancient that they seem otherworldly. In the Bisti Badlands, for example, you can see the petrified fragments of a coastal rain forest, including palm trees, from 70 million years ago. 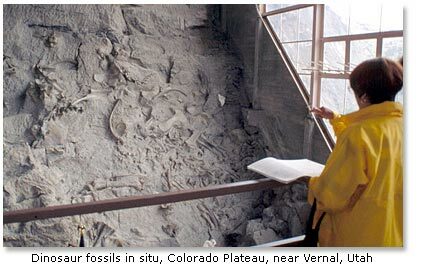 At Dinosaur National Monument, on the border of Utah and Colorado, you can see hundreds of fossilized bones of dinosaurs from 150 million years ago. At Petrified Forest, in northwestern Arizona, you can see an entire forest of petrified trunks of trees from 225 millions years ago. While the presumed subsurface sea of molten rock never breached the overall structural integrity of the Colorado Plateau, it did challenge depositional beds in some areas, jacking them upward into 10,000- to nearly 13,000-foot high igneous and sedimentary rock mountains, including, for instance, the La Sal, Henry and Abajo ranges of Utah; the San Francisco and White ranges of Arizona; and the Chuska range on the Arizona and New Mexico border. As in the Southern Rocky Mountains, volcanic activity, erosion and glaciation all contributed to the shaping of the Colorado Plateau peaks. As in the Southern Rockies, too, lichens, mosses and herbs cling to the highest pinnacles. Englemann spruce and subalpine fir dominate the elevations roughly between 11,000 and 9500 feet; Douglas fir and aspen, between 9500 and 8000 feet; ponderosa pine and Gambel oak, between 8000 and 6500 feet; the pygmy forests, along the lower flanks. The plant communities merge into each other as they march down the mountain sides, changing, growing now higher, now lower, in answer to sun exposure, moisture and prevailing winds. Below 6000 feet, Galleta grass and Indian rice grass extend from the Great Basin into the northern reaches of the Colorado Plateau, and the gramas from the plains extend into the southern reaches. Wildlife populations essentially mirror those of the mountain ranges to the east. Typically, the mountain climates and annual precipitation match those of the Southern Rockies, with winter storms driving temperatures to well below 0 degrees Fahrenheit and delivering snowfall of more than 30 feet on the highest mountain peaks. The arid lands of the lower elevations experience warm days and cool nights in summer and chill days and icy nights in the winter. Annual average precipitation measures less than 10 inches in the driest areas. Snow and rain fall primarily in the winter in the northern third of the Colorado Plateau; precipitation usually comes in summer and again in winter in the southern two thirds. The Colorado Plateau falls away to basin and range country along its southern edge, the Mogollon Rim, an escarpment which extends for more than 200 miles from west central New Mexico to northwestern Arizona. In some areas, the Rim, blanketed by the largest forest of ponderosa pine trees in the nation, stands 2000 feet above the basin floor. Perhaps more than any other physiographic province in North America, the Colorado Plateau summons the adventurous traveler to its natural bosom, to its wide range of stories from the earth. It moved Edward Abbey to write, in his essay about Grand Canyon, "Forty Years as a Canyoneer," in One Life at a Time, Please, "When my own turn comes to lie down, die, and decay, nourishing in the process some higher form of life  a clump of sage, a coyote, a prickly pear, a pissed-on aspen tree  I hope that the blessed event takes place high on a canyon rim, with a final vision of red cliffs, magenta buttes, and purple mesas in my fading eyes." Now, it’s time to go down to the basin and range country. The basin and range country of our Southwest, with three deserts (not including Nevada’s Great Basin Desert) and many dozen mountain ranges, spans some 200,000 square miles, a region roughly the size of France. The Chihuahuan Desert, the easternmost and largest of the three, begins deep in Mexico, in San Luis Potosi, and extends north northwest, between two mountain ranges, for more than 1000 miles, reaching across western Texas and southern New Mexico. Most of its basins, filled with sandy, light-colored and organically impoverished soils eroded from the mountain slopes, lie about 4000 feet above sea level. Grama grasses, prickly pears, yuccas and honey mesquites grow in deeper basin soils. The creosote bush, a toxic adversary for neighboring plants and a fierce competitor for water, dominates gravely slopes. The lechugilla commands a spiny army of ocotilla, sotol, cholla and yuccas on mountain foothills. Antelope, mule deer, mountain lions, bobcats, gray wolves, coyotes, gray foxes, black bears, grizzly bears (until the mid-20th century), collared peccaries, black-tailed jack rabbits and desert cottontails comprise much of the mammal community. Birds from golden and bald eagles to Lucifer hummers either live in, or migrate through, the region. Surprisingly, more species of birds have been recorded in the Big Bend than in any other national park in the United States. Winters, especially in the northern Chihuahuan Desert, are typically cool, with nighttime temperatures falling below 32 degrees Fahrenheit; summers, especially during the driest and windiest months, May and June, are typically hot, with daytime temperatures often exceeding 100 degrees. Rainfall, which averages about eight inches per year, comes mostly during the monsoon season, from July through September. The Sonoran Desert, the middle of the three, begins well down in Mexico, on both sides of the Gulf of California, and it extends northward several hundred miles into southern Arizona and California. In the southeast quadrant of Arizona, in an area called the "Arizona Upland," the Sonoran Desert basins lie at elevations as high as 3000 feet above sea level, and near the junction of the Arizona, California and Sonora borders, in the area called the "Lower Colorado Valley," the basins lie at elevations just above sea level. 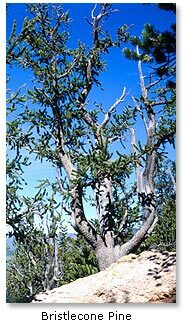 The regal saguaro cactus, which grows up to 50 feet in height, presides over a complex plant community  perhaps the most diverse of any desert in the world  in the Arizona Upland. The lowly creosote and white bursage dominate the notably simple and sparse plant community of the Lower Colorado Valley. The mammal community resembles that of the Chihuahuan Desert, and the bird community shows comparable diversity. The biological richness of the Arizona Upland arises from the amount of average annual rainfall, six to twelve inches, which falls primarily in the monsoon season of late summer and the intermittent rain storms of mid-winter. The biological impoverishment of the Lower Colorado Valley reflects summer air temperatures of more than 120 degrees Fahrenheit, soil surface temperatures of 180 degrees Fahrenheit, humidity of less than 10 percent, and annual average rainfall of three inches or less. Sometimes, years pass with no rainfall at all in parts of the Lower Colorado Valley. The Mohave Desert, the third in our series, begins in far northwestern Arizona and extends across southern Nevada and well into southern California. Its basins lie at elevations generally ranging from approximately 4000 feet above sea level near the Nevada/California border to 282 feet below sea level in Death Valley. The Joshua-tree, a species of yucca which may grow to 50 feet in height, stands as the signature plant of the Mohave. The most dense stands occur at the perimeter of the desert, at the higher elevations. Low and widely scattered shrubs such as the creosote bush, mesquites and big sagebrush cover much of the lower landscape. Plants from the neighboring Sonoran Desert merge with Mohave plant communities in the south, and plants from the Great Basin join with Mohave plants in the north. Virtually no plants, other than those at the microscopic level, grow in the salt flats at the bottom of Death Valley, although a few salt-tolerant plants such as pickleweed and rushes grow around edges of the saline springs and marshes. The mammal community, for instance, coyotes, badgers, kit and gray foxes, black-tailed jackrabbits and desert cottontails, resembles those of the Chihuahuan and Sonoran deserts. The bird community lacks the diversity of the two other of the other two deserts. Annual average precipitation, which falls primarily in the winter, equals less than six inches in the higher elevations and less than two inches in Death Valley. Winter temperatures sometimes reach freezing levels. Summer temperatures can exceed 130 degrees Fahrenheit in Death Valley, with ground surface temperatures sometimes reaching 190 degrees Fahrenheit, only 22 degrees below the boiling temperature of water at sea level. The region’s mountain ranges, which generally trend from north to south, rise like islands from the desert sands. 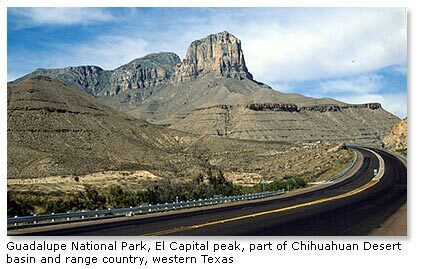 Some, for instance, the Guadalupe Mountains of western Texas, originated as reefs of marine organisms in a quiet ocean, lay entombed in sediments after the waters withdrew, then arose in an episode of mountain building. Others, like the San Andres Mountains of south central New Mexico, began as deposits of sediments in a primal ocean, rose as part of a bulge in the earth’s crust, and remained standing at the rim after the structural center’s collapse. Still other ranges, for instance, those surrounding Tucson, evolved from a complex sequence of magmatic intrusions, volcanic eruptions, crustal deformation, mountain building, and structural fracturing and slippage. Some ranges, for example, the Sacramento Mountains of southeastern New Mexico and the White Mountains of eastern Arizona, rise high enough to support plant and wildlife communities similar to those of the Southern Rockies. The highest peaks may receive 30 inches or more of precipitation in a year while the desert basins below receive eight inches or less. Other, low ranges, which receive little precipitation and experience high temperatures, can only support plant and wildlife communities similar to those of their neighboring desert basins. East of the Llano Estacado, virtually the entire area comprising the Southern Rocky Mountains, the Colorado Plateau and the basin and range country empties its waters into only two river systems  the Rio Grande or the Colorado River  or into intermittent, dead-end drainage systems. Water courses became conduits for travel, especially in the basin and range region. The Rio Grande system drains much of the Southern Rockies and northern Chihuahuan Desert, a region encompassing 380,000 square miles. The river rises in the San Juan Mountains of southwestern Colorado. Fed by a few perennial tributary rivers and streams and numerous intermittent streams, it flows nearly 1900 miles to discharge its waters into the Gulf of Mexico at the southernmost tip of Texas. The Colorado River system drains part of the Southern Rockies, all of the Colorado Plateau and much of the northern Sonoran Desert, an area of almost 430,000 square miles. It rises in the alpine meadows of Rocky Mountain National Park, in north central Colorado and flows some 1400 miles to the Gulf of California. Along its route, it receives the waters from six perennial tributary rivers and from some perennial and many intermittent streams. Descending from mountain slopes and foothills, some perennial and intermittent streams  for example, the Mimbres River of southwestern New Mexico’s Gila Wilderness  discharge into open desert basins, the waters soaking into the sands or evaporating into the sky long before reaching the Rio Grand or Colorado River systems. Despite the aridity of the general region, perennial rivers and streams and the intermittent waterways wind for thousands of miles through the basin and range country. Although the drainages ebb and flow, the rhythms of their waters regulated by the capricious rain and snowfall of the mountains and desert basins, they have cradled and nurtured the Southwest’s richest biological systems. Before the Europeans came, gallery forests, usually dominated by 60-foot tall, well spaced Fremont cottonwoods and their willow lieutenants, occupied long stretches of river and stream banks. Beyond the flood plains, the stands of trees thinned, giving way to open savannahs, grassland and, quickly, the desert. Occasionally, open, park-like mesquite savannahs, or "bosques," occupied the banks. The mesquites grew as tall as cottonwoods. The riparian forests and savannahs  probably relics of the wetter and cooler Ice Ages  sheltered and nourished colonies of wildlife, including, for instance: dozens of mammal species, from the diminutive silky pocket mouse, which may weigh no more than a quarter ounce, to the grizzly bear, which can approach a half ton; hundreds of resident and migratory bird species, from the black-chinned hummingbird, with a three-inch wingspan, to the bald eagle, with an eight-foot wingspan; and dozens of reptile species, from the harmless six-inch-long tree lizard, which feeds on insects and spiders, to the fearsome seven-foot-long western diamondback rattlesnake, which feeds on rabbits, rodents and birds. The forests and savannahs and their supporting streams  threads of green across the desert  attracted the attention of early travelers. Famed late 17th and early 18th century Spanish Jesuit missionary Father Eusebio Francisco Kino and his diarist companion Juan Mathes Manje spoke of "abundant and very dense woods, which were on these most fertile banks," at the junction of the Colorado and Gila rivers in the Lower Colorado Valley, one of the hottest driest areas in the basin and range country. Captain Juan Bautista de Anza, who established an overland route from Mexico to the California coast in the 18th century, said that the lower Colorado River had an "immense grove of cottonwoods, willows useful for thatching, and other trees, both upstream and down." Doctor J. M. Bigelow, who accompanied Lieutenant Amiel Weeks Whipple during a railroad survey across the Southwest in the 1850’s, said, "Along the valley of the river [the Lower Colorado Valley], alamo [cottonwood], mezquite, and willow form the principal and almost entire, kinds of trees." The lure of the trails across the Llano Estacado, the Southern Rockies, the Colorado Plateau and the basin and range country vested the newcomers with a sense of exhilaration and the experienced with a feeling of caution and foreboding. According to Castaneda, Coronado’s exploratory expedition of the Southwest began, in 1541, with the expectation of finding "Seven Cities" of Cibola with great wealth and "marvels and wonders" in the new lands. Mexico’s viceroy, Don Antonio de Mendoza, addressed the conquistadores, said Castaneda, and "made a very eloquent short speech, telling them of the fidelity they owed to their general and showing them clearly the benefits which this expedition might afford, from the conversion of those peoples [the Indians] as well as in the profit of those who should conquer the territory, and the advantage to His Majesty... The next day after this was done, the army started off with its colors flying." According to chronicler Gaspar Perez de Villagra, when the conquistador Don Juan de Onate announced that he would lead an expedition up the Camino Real de Tierra Adentro (Royal Highway of the Interior Lands) to found the first Euroamerican colony in the Southwest, in 1598, "…soldier flocked to enroll under Onate’s banners. They came like gallant courtiers assembling for some gay tourney… Many sold all their worldly goods that they might fit themselves properly to enlist… To the strains of martial music these gay cavaliers assembled from all parts, a brave and gallant band of seasoned veterans, enthusiastic and eager for the conquest." At the beginning of her trip two and a half centuries later, Susan Magoffin said, "The curtain raises now with a new scene… From the city of New York to the Plains of Mexico, is a stride that I myself can scarcely realize." Some, who knew the hardships of the trails, felt more sober. U. S. Army Captain Randolph B. Marcy, in his 1859 The Prairie Traveler  "The Best Selling Handbook for America’s Pioneers,"  told caravans that "their first business should be to organize themselves into a company and elect a commander. The company should be of sufficient magnitude to herd and guard animals, and for protection against Indians." Prior to starting a trip on John Butterfield’s Overland Mail line from San Francisco to St. Louis in 1860, English clergyman William Tallack, speaking of himself in the third person, said, "...he often felt doubtful as to how far he might be able to endure a continuous ride of five hundred and forty hours, with no other intermission than a stoppage of about forty minutes twice a day, and a walk, from time to time, over the more difficult ground, or up and down stiff hills and mountain passes, and with only such repose at night as could be obtained whilst in a sitting posture and closely wedged in by fellow-travellers [sic] and tightly-filled mail-bags." Before a cattle drive up the Goodnight and Loving Trail, along the Pecos River, in 1867, famed rancher Charles Goodnight had warned his drovers: "Knowing the dangers of traveling through an Indian infested country, I endeavored to impress on these men," he said, "the fact that only by traveling by night could they hope to make the trip in safety." Oliver Loving and another man would disregard Goodnight’s counsel. The Comanches attacked them. Loving paid with his life.